The AMC AMX really got ignored for many years. You used to be able to get this car with a 390 V8 and rear seat delete for very little. The issue was it being an AMC and that had a black cloud over it. Sorry to say, it wasn’t the most revered of car makes. I have watched the auctions for years and this car still does not bring the big money. I have seen this car fully restored to the nines and it still barley got above 35k. That is a darn shame. The car is a looker, the car can run like a wild ape and the car is the real deal. Parts are available at reasonable prices and some parts if you study hard enough are actually easier to source than you think. They did have some rust issues but so did most of the other cars of the era. This car was light and if you had that big engine you could fool some poor slob on the street into thinking you had a loser mobile. It appears this car in the picture has lived a decent life. Clearly it needs some work but with a paint job and some other updates this car could become a great cruiser for you. You know when you go to a car show you see rows of Mustangs, Camaros, and Mopar’s. You really do not see many of these so this is an opportunity to set yourself apart from the crowd. 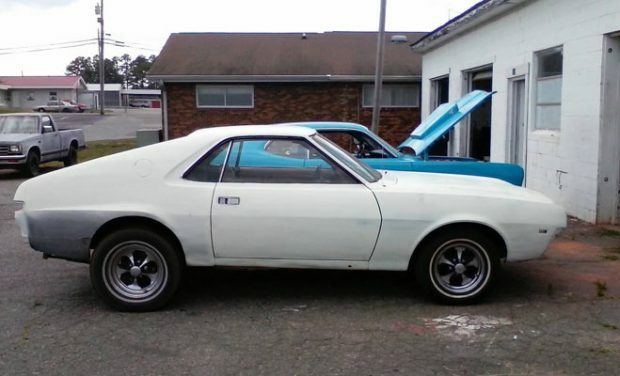 The AMC AMX and Javelin SST are always great finds and always remember it is the person who has the confidence to stand out with an unusual car turns heads. ← Previous Story An Incredibly Rare 1970 Dodge Challenger R/T ‘Cream Dream’, 1 of 2. Still “awkward-looking” after all these years.